In any emerging industry, there are turning points that bear watching. One of those occurred Tuesday when BrightSource Energy, a California developer of solar power plants, announced the appointment of John E. Bryson as its new chair. Bryson is a key player in the energy-enviro-regulatory industrial complex, and a member in good standing of the Fortune 500 whose decision to join BrightSource is another signal that Big Solar will be a Big Thing. A co-founder of the Natural Resources Defense Council in 1970, Bryson went on to become chair and chief executive of Edison International, one of the United States’ largest utilities. 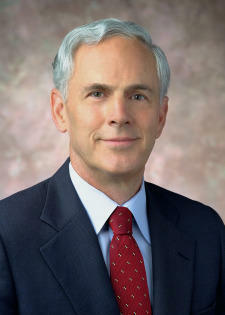 He also serves on the boards of Boeing and Disney, as well as the Santa Monica electric car startup Coda Automotive. He is also an advisor to New York private equity and buyout giant Kohlberg Kravis Roberts & Co.
Before going corporate, Bryson was president of the California Public Utilities Commission and California State Water Resources Control Board. In short, Bryson, 67, is someone who knows his way around the top echelons of the nation’s energy and financial power structure. Such connections will be key for BrightSource. The company has so far signed contracts to supply more than 2,600 megawatts of electricity to California utilities PG&E and Southern California Edison. It will need to secure many billions of dollars in financing to build more than a dozen large-scale solar power plants to fulfill those deals. The California Energy Commission on Wednesday is expected to license BrightSource’s first solar project, a 370-megawatt power plant to be built in Southern California’s Ivanpah Valley. BrightSource has shown itself adept at developing strategic relationships. It counts Google, Morgan Stanley, and Chevron as its investors and brought on engineering giant Bechtel as the chief contractor to build its first power plant as well as to take a stake in the project. The same day this week that The New York Times published an extensive report by correspondent Keith Bradsher on China’s massive subsidies for renewable energy companies, Ernst & Young released a study showing that, not surprisingly, China has overtaken the United States as the most attractive place for green tech investment. Some of that government support may violate World Trade Organization rules. On Thursday, an American union, the United Steelworkers, filed an unfair trade complaint against China with the Office of the United States Trade Representative. But the Ernst & Young report points to failures on the part of the U.S. government to take action that would attract green investors. For one thing, Congress has so far failed to establish a national Renewable Energy Standard that would require the country’s utilities to obtain a certain percentage of electricity from non-carbon-emitting sources. Also, a federal tax subsidy program that is spurring construction of big solar power plants expires at the end of the year and legislation to extend the incentives is languishing in Congress. China, in contrast, “aims to reach an installed capacity of 300GW [gigawatts] of hydro, 70GW of nuclear, 100GW of wind, and 20GW of solar capacity by 2020,” according to the Ernst & Young study. Reports by the U.S. Energy Information Agency provide a glimpse of the green imbalance of trade between the two countries. The figures from 2008 — apparently the latest available from the government — show that fewer than 1 percent of U.S.-made solar modules were shipped to China while nearly 23 percent of Chinese-made photovoltaic modules were exported to the U.S. Since then, Chinese imports have risen dramatically. At the end of 2009, for instance, Chinese firms supplied about half the California solar market alone, according to Bloomberg New Energy Finance, a consulting firm. 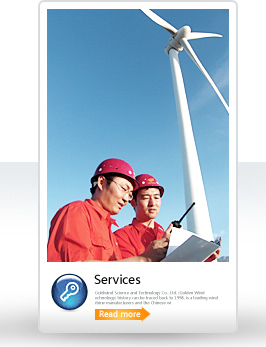 What China is not exporting, of course, is green jobs. Talk about sporting greens: On Wednesday, all of the United States’ professional sports leagues said they would distribute a guide on how to switch to renewable energy and urge their teams to solarize their stadiums. The guide was prepared by the Natural Resources Defense Council (NRDC) and the Bonneville Environmental Foundation and marks a new alliance between environmentalists and the nation’s baseball, football, hockey, and soccer teams. “It’s not a league mandate, it’s not a requirement for stadiums and arenas to install solar panels, but it indicates an important cultural shift recognized by professional sports that all arenas and stadiums in the country should at least consider and evaluate the opportunity that solar power might provide,” Allen Hershkowitz, a senior scientist with the NRDC, said during a conference call Wednesday. In other words, if Jill Six-Pack sees that the Yankees have gone solar she might consider doing the same. Representatives from the National Basketball Association, the National Hockey League, and other stadiums said that economics as well as the environment were pushing them to go green. Benge noted that Qwest Field’s electricity rates had jumped 18 percent this year, which played a part in the stadium’s decision to solicit bids to install a 600-kilowatt solar array. 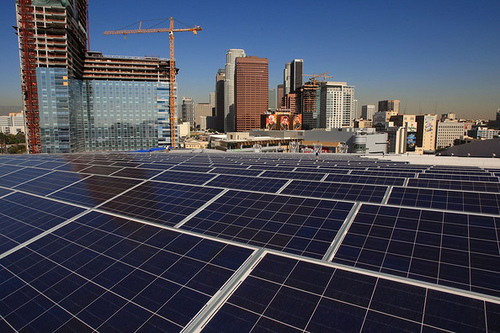 In Los Angeles, the Staples Center flipped the switch on a 345.6-kilowatt photovoltaic system that has so far saved $100,000 in electricity costs, according to Lee Zeidman, executive vice president for operations for the facility. The Staples Center has gone beyond solar to install waterless urinals that save seven million gallons of water annually, and switched to non-toxic cleaning products. Other teams have tackled the waste issue. Scott Jenkins, the vice president of ballpark operations for the Seattle Mariners, said the team has saved $1 million over three years by recycling 80 percent of the waste generated at games. Gary Betteman, commissioner of the National Hockey League, said 30,000 shopping bags were replaced with reusable totes during the Stanley Cup, and he noted that several NHL venues have installed solar panels. Stadium managers acknowledged that sports’ biggest carbon footprint comes from fans driving to and from games. The challenge, they said, will be to get more fans to take public transportation as well as to build arenas in urban areas with accessible mass transit. For his part, Hershkowitz said he was astounded that it has taken the environmental movement 40 years to forge a strong alliance with professional sports. The California Legislature started out the week in the green by passing the nation’s first energy storage bill. But legislators quickly ran into the red Wednesday when they failed to approve legislation to impose a statewide ban on plastic bags, or codify Governor Arnold Schwarzenegger’s executive order that utilities obtain a third of their electricity from renewable sources by 2020. But don’t go crying in your organic beer yet. On Thursday, the California Public Utilities Commission signed off on 650 megawatts of new solar energy contracts and programs. Whch all goes to show that in the Golden State, environmental politics are not green and brown. And despite the fate of Proposition 23, the oil company-bankrolled ballot initiative to suspend California’s global warming law, the state’s panoply of green laws allows progress to be made on various fronts. The utilities commission, for instance, approved contracts for two giant photovoltaic solar farms to be built in the Mojave Desert by First Solar. Together they will supply 550 megawatts of electricity to the utility Southern California Edison. Commissioner Timothy Simon noted at Thursday’s energy commission meeting in San Francisco that the price for that electricity is lower than previous solar contracts, another sign that photovoltaic power is edging ever closer to edging out fossil fuels. The price also speaks to the ability of First Solar, the Tempe, Ariz.-based thin-film solar company, to win and begin to execute big projects. The commission also greenlighted San Diego Gas & Electric’s proposal for 100-megawatt’s worth of small-scale photovoltaic projects. Most installations will be 1 or 2 megawatts and built in parking lots or other open spaces where they can be plugged into the grid without expensive transmission upgrades. The move comes on top of 1,000 megawatts of distributed solar generation that the utilities commission previously approved for California’s two other big utilities. Michael R. Peevey, the president of the utilities commission, said despite the failure of the state legislature to institutionalize the 33 percent renewable portfolio standard — currently subject to reversal by the next governor — California was on a solar streak. 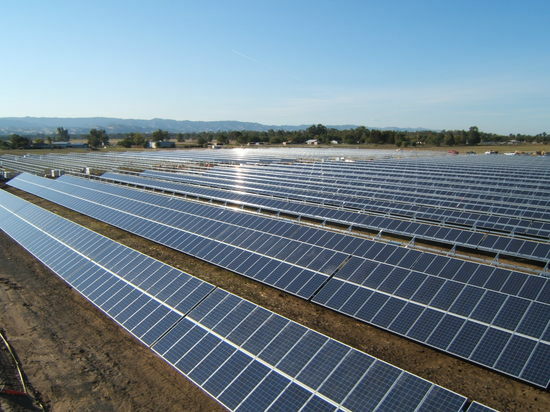 “With approval of this project we’ll have added 1,100 megawatts of photovoltaic electricity by the three utilities,” said Peevey, noting that separately the California Solar Initiative will add another 3,000 megawatts and that by year’s end regulators are poised to approve big solar farms that will generate 4,700 megawatts of electricity. In an article in The New York Times on Wednesday, I wrote about an ambitious plan to build one of the world’s largest solar energy complexes on 30,000 acres of farmland in the San Joaquin Valley of California. Elsewhere, big renewable energy projects have encountered opposition from farmers, ranchers and environmentalists who worry about the impact of solar power plants on agriculture, wildlife and scarce water supplies. But farmers in the San Joaquin Valley’s Westlands Water District are embracing solar power as a solution to their water woes. And environmental groups are backing the project as a way to avoid fights over building solar power plants in pristine desert areas. In the 1960s, the west side of the San Joaquin Valley was transformed from a desert to one of the nation’s most productive agricultural centers thanks to a huge irrigation project that transports water from Northern California and distributes it to 600,000 acres of farmland through 1,034 miles of underground pipes. Decades of irrigation and drainage problems led to a buildup of salt in the soil that forced the water district to spend $100 million to acquire and retire 100,000 acres of land from most agricultural production. Drought and environmental disputes over the impact of water diversions on endangered fish, meanwhile, slashed water deliveries to Westlands farmers. The water district hopes to make money off salt-contaminated land by providing an initial 12,000 acres to Westside Holdings, a firm that has proposed building a 5,000-megawatt photovoltaic power complex called the Westlands Solar Park. And farmers like Mark Shannon have agreed to lease their parched land to Westside, reluctantly concluding there’s more money to be made by growing electrons than crops. Mr. Shannon took me up in a small plane for a bird’s-eye view of the impact of the water crisis on his land, where brown fields surround green patches of almonds and pistachios. Beyond his farm are dry lands that stretch to the horizon, property owned by the Westlands Water District and taken out of irrigated production. Desperate farmers have been spending millions of dollars drilling hundreds of deep groundwater wells, which in turn has caused subsidence problems. In other parts of California, the prospect of covering square miles of farmland with solar panels has stirred outrage among some rural residents. But Mr. Shannon and Westlands officials don’t expect any significant opposition in the San Joaquin Valley. The reason: if farmers such convert their land to solar farms, their water allocations will be redistributed to their neighbors. 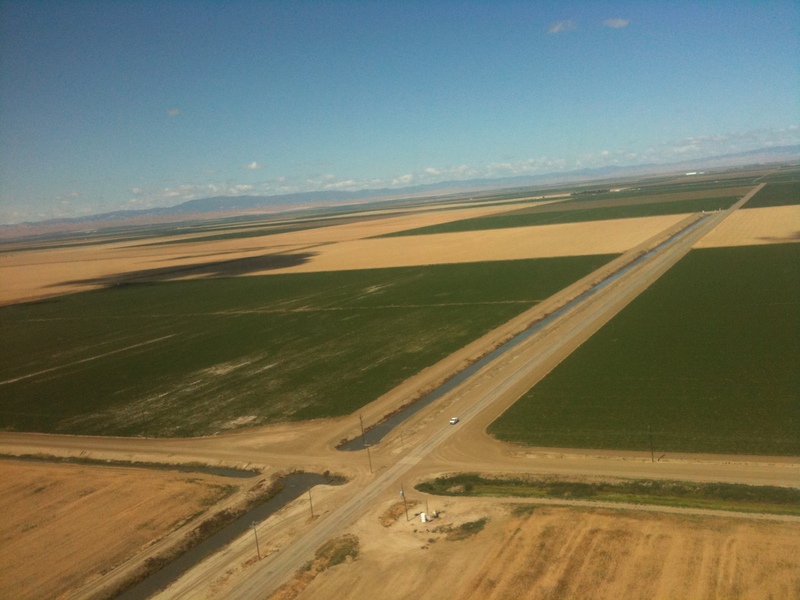 LEMOORE, Calif. — Thousands of acres of farmland here in the San Joaquin Valley have been removed from agricultural production, largely because the once fertile land is contaminated by salt buildup from years of irrigation. But large swaths of those dry fields could have a valuable new use in their future — making electricity. Farmers and officials at Westlands Water District, a public agency that supplies water to farms in the valley, have agreed to provide land for what would be one of the world’s largest solar energy complexes, to be built on 30,000 acres. At peak output, the proposed Westlands Solar Park would generate as much electricity as several big nuclear power plants. Unlike some renewable energy projects blocked by objections that they would despoil the landscape, this one has the support of environmentalists. The San Joaquin initiative is in the vanguard of a new approach to locating renewable energy projects: putting them on polluted or previously used land. The Westlands project has won the backing of groups that have opposed building big solar projects in the Mojave Desert and have fought Westlands for decades over the district’s water use. Landowners and regulators are on board, too. Recycling contaminated or otherwise disturbed land into green energy projects could help avoid disputes when developers seek to build sprawling arrays of solar collectors and wind turbines in pristine areas, where they can affect wildlife and water supplies. The United States Environmental Protection Agency and the National Renewable Energy Laboratory, for instance, are evaluating a dozen landfills and toxic waste sites for wind farms or solar power plants. In Arizona, the Bureau of Land Management has begun a program to repurpose landfills and abandoned mines for renewable energy. In Southern California, the Los Angeles Department of Water and Power has proposed building a 5,000-megawatt solar array complex, part of which would cover portions of the dry bed of Owens Lake, which was drained when the city began diverting water from the Owens Valley in 1913. Having already spent more than $500 million to control the intense dust storms that sweep off the lake, the agency hopes solar panels can hold down the dust while generating clean electricity for the utility. 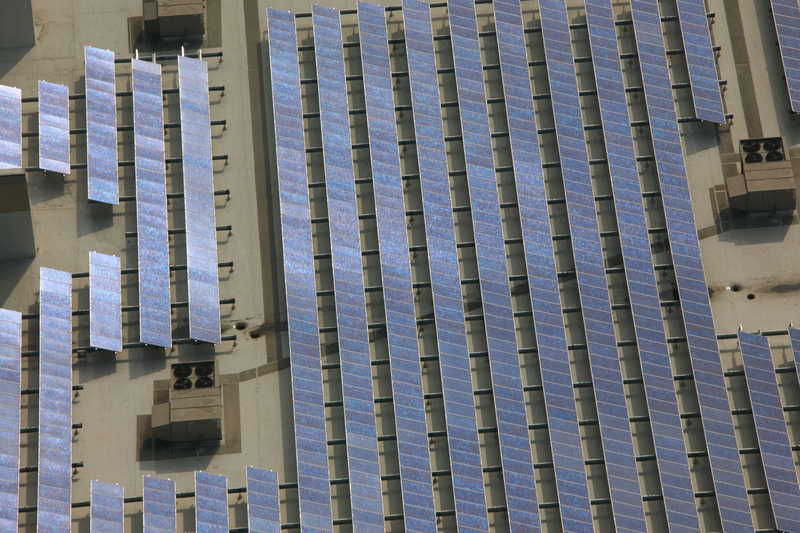 A small pilot project will help determine if solar panels can withstand high winds and dust. “Nothing about this is simple, but it’s worth doing,” Austin Beutner, the department’s interim general manager, said of the pilot program. All of the projects are in early stages of development, and many obstacles remain. But the support they’ve garnered from landowners, regulators and environmentalists has attracted the interest of big solar developers such as SunPower and First Solar as well as utilities under pressure to meet aggressive renewable energy mandates. Those targets have become harder to reach as the sunniest undeveloped land is put off limits. Last December, Senator Dianne Feinstein, Democrat of California, introduced legislation to protect nearly a million acres of the Mojave Desert from renewable energy development. But the senator’s bill also includes tax incentives for developers who build renewable energy projects on disturbed lands. For Westlands farmers, the promise of the solar project is not clean electricity, but the additional water allocations they will get if some land is no longer used for farming.